There is a theory that “Rome fell” because of its policy of “bread and circuses” – that is, in the Roman republic, the average citizen was a stout, independent yeoman farmer who participated in government through the plebeian assembly and served in the army out of duty. But as the republic became the empire such people were transformed into the proletariat – they sold out to the latifundia, and moved to Rome, where they lived in slums, and cared for nothing beyond their daily bread ration and for watching gladiatorial combat and supporting their favorite charioteers. Thus does the expression “bread and circuses” indicate the Roman policy of buying off the lower orders with cheap carbs and free entertainment. No longer were they politically engaged – they simply let Rome fall while they amused themselves to death. Does this remind you of anyone? Are we not content as long as we have our junk food and ESPN on massive television screens? I’d call it Plato’s Cave if that weren’t another classical metaphor. But I don’t think that this “portentous” reason for the Fall of Rome is necessarily useful. For in an age of social media, many people treat politics way more seriously than it deserves to be. I know people who cheer for their political party in the same the way that some people cheer for the Georgia Bulldogs, or that some ancient Romans cheered for the drivers of the Blue team. You could say that they’re politically engaged, for sure, but not in a useful way. Politics ought to be a small part of life, but when it becomes all-consuming, that too is symbolic of a certain decline. The century from 130 to 30 BC marks the transformation of the Roman Republic into the Roman Empire – that is, a polity ruled by an actual emperor, not just a large collection of territories, which it was already. In fact, Rome’s expansion to rule the entire Mediterranean basin outshot its ability to change its constitution peacefully. Eventually the constitution did get changed, but only after a century of intermittent civil war, and mostly as an expedient: Augustus held ultimate power, because that was better than chaos. Of course, Augustus’s rhetoric was that he “restored the republic,” but that was one of those statements that everyone had to publicly agree to, while simultaneously acting as though the reverse was true. If the President were to hold his office for life, and simultaneously act as Speaker of the House of Representatives and Chief Justice of the Supreme Court, also for life, no one would think that the United States was still a republic in any meaningful sense, because there would no longer be any separation of powers. At one point most educated people knew about the decline of the Roman Republic. 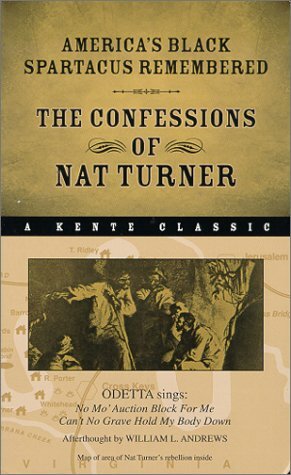 It is an epic tale anyway, but it also provided instructive examples for subsequent generations. The biggest one, I think, is the notion that republics are inherently unstable, that in order to function properly they are too dependent on the personal integrity of their public servants, and it is only a matter of time before they break down into faction and civil war as human nature reasserts itself. It took a long time before people were willing to take a risk on republicanism again, at which time republican Rome served as an example of certain things to avoid: it is generally a bad idea that politicians should simultaneously act as military officers, for the obvious reason that they will be too tempted to use their armies to further their political ambitions. In the United States, you can seek a political career after a military one, but you have to resign your commission first. But that was not the case in the first century BC. The days of Cincinnatus were long gone. The Senate called Cincinnatus (519-430 BC) out of retirement and granted him dictatorial powers to deal with a crisis. Cincinnatus did so with dispatch, and immediately resigned, even though he could have stayed on for the remainder of his six-month term. His name thereafter became a byword for civic virtue – a shining example of someone who served because it was his duty, and not because he was hoping to profit from the office. 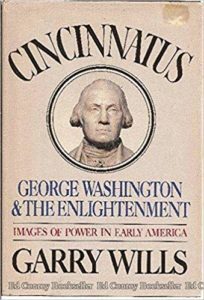 George Washington, because he resigned his command of the Continental Army, and because he resigned the presidency after two terms, is naturally known as the American Cincinnatus. A club for revolutionary war officers and their descendants took the name the Society of the Cincinnati in honor of Cincinnatus; the city in Ohio takes its name from this group. But how can you compel politicians to act like this? Well, you can’t. All you can do is praise the people you would like to serve as models, and even then the narcissists and sociopaths who are attracted to power won’t care a toss about any “virtue.” It is very difficult anyway, over the long run, to enforce the custom of self-sacrifice for the greater good. Eventually it gets really old, both for individuals and for societies. Thus, by 130 BC, the people who did very well out of the wars against Carthage and Macedonia were quite enjoying their power and wealth, thank you very much, and were not interested in giving it up. Some of them bought up land in Italy and worked it with huge gangs of slaves. There is no way that the independent yeoman farmer could compete with this, rather as America’s small-town mom-and-pop stores cannot possibly compete with Walmart and other big-box retailers. What could a plebeian do but sell out to the latifundia (as these plantations were called), move to the big city, and try to find some form of work there? Rome’s population ballooned during this time, mostly on account of poor people taking up residence in the slums of the city – a phenomenon noticeable in the Third World today. The Gracchi brothers, Tiberius (d. 133) and Gaius (d. 121), deplored this situation and sought to arrest it. They both served as tribune – an office created in the early fifth century to act as a “voice of the people” against the patricians who dominated the Senate and all the other offices of state. Tribunes were licensed to “speak truth to power” and thus possessed sacrosanctity, a kind of diplomatic immunity: anyone harming a tribune could be instantly killed. This is why so many newspapers call themselves “tribune” – they are hoping that their readers will think of them as a fearless voice of the people against powerful interests. The brothers Gracchi both promoted land reform. Generally, they wanted to limit the size of the latifundia, and redistribute the surplus to veterans, so that these people who had served Rome would at least have something to live on in their retirement. But the senators did not really appreciate this return of old Rome, the Rome of the independent plebeian farmer, and so contrived to have them both killed. Killed! Despite their sacrosanctity. This sad episode marks the beginning of a cycle political violence that was to plague Rome for a long time to come. It also reminds me of the story of Jacobo Árbenz, president of Guatemala 1951-54. Árbenz also proposed land reform – the government would buy up some of the extensive holdings of the United Fruit Company and redistribute it to landless Guatemalan peasants, compensating the company for the value of the land as it had been reported for tax purposes. Of course, the land was worth much more than that, and the United Fruit Company lobbied the US State Department to oppose the policy, on the principle that this was Communism! (“If it walks like a duck and it quacks like a duck, then it’s a duck.”) The CIA then fomented a military coup, which installed Carlos Castillo Armas as president, who obligingly ended the proposed land reforms. Árbenz was not killed in the coup, but he died drunk and in exile in 1971, and Central America was made safe for American capitalism. This episode is not well known in America, but it is very well known south of the Rio Grande, along with all the other instances of American meddling in Latin America over the course of the twentieth century, for fundamentally selfish reasons. One of the problems of the Roman latifundia is the same problem faced by all slave economies: the slaves represent a security risk. Naturally, they resent their condition, and if they outnumber their owners, they will take any chance they get to rebel. One of the most famous slave rebellions in history was that of Spartacus (d. 71 BC), a gladiator who organized his fellow gladiators at their school in Capua, who rose up and killed the owners, escaped from the school, and spent the next two years ravaging southern Italy, freeing latifundia slaves and killing anyone who opposed them, and amassing an ever-greater army. Eventually this force was defeated by Pompey and Crassus, two Roman generals who had been tasked with doing so. The body of Spartacus was never found, but some six thousand slaves were crucified along the Appian Way as a warning to survivors never to try such a thing again. Nevertheless, Spartacus became a hugely inspirational figure for slaves throughout history: Toussaint L’Ouverture, the leader of the Haitian Revolution, was sometimes called the Black Spartacus, as was Nat Turner, leader of a slave rebellion in Southampton County, Virginia in 1831. Communists were also inspired by Spartacus, on the principle that industrial workers were basically slaves. Thus we have Rosa Luxembourg and Karl Liebknecht’s Spartacus League, a post-Great War Marxist revolutionary movement in Germany, the Soviet athletic club Spartak, and the Spartakiad, a communist answer the Olympic Games. Of course, we also got a great sword-and-sandal movie out of it, and a more recent television series. 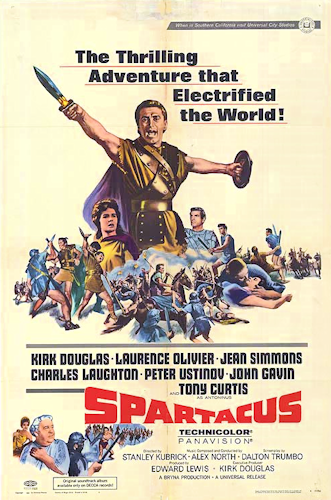 The scene at the end of the movie, when all the slaves in turn proclaimed “I’m Spartacus!” in order to protect the real Spartacus, has been inspirational to subsequent films and to US Senators. Pompey and Crassus subsequently dominated Rome as members of the First Triumvirate. The third member was of course Julius Caesar, a man of overwhelming ambition who was in the process of subduing Gaul and making sure that everyone knew about it. He would send reports of his exploits back to Rome to be read in the Forum; collected, these reports comprise Caesar’s Gallic Wars, a classic text for Latin instruction. Pompey and Crassus doubtlessly felt that an alliance with Caesar would be to their benefit. But Crassus was killed fighting Mithridates of Pontus, and Pompey, in Rome, grew suspicious of Caesar’s popularity and so recalled him from Gaul. Caesar did return, but at the head of his army. He had command of Legio XIII in Gaul, but not in Italy, so when he crossed the Rubicon River, which formed the boundary between the two provinces, he was in essence declaring war on the Roman state. Thus has “crossing the Rubicon” come to indicate an irrevocable decision, for which the only results can be death or glory. “Alea iacta est,” Caesar is alleged to have said as he entered Italy: “the die is cast” (“die” as singular of “dice,” and “cast” as in “rolled” – it’s not a reference to casting bronze or iron in a mould, as some people believe). The HBO television series Rome at one point has Caesar’s lieutenant Marc Antony telling his boss that “some would call it hubris.” “It’s only hubris if I fail,” replies Caesar – and it’s true, ultimately Caesar won, against Pompey, against the forces of Ptolemy XIII in Egypt, and against Pharnaces of Pontus, a victory that was so easy that Caesar coined the memorable Laconic phrase “Veni, vidi, vici” to commemorate it. (“I came, I saw, I conquered” gets referenced every now and then, including in the movie Ghostbusters and by Hillary Clinton and Ludacris.) Caesar, it seems, was a master of rolling the dice. “Brutus” has thus become a byword for “assassin,” for either noble or base motives. 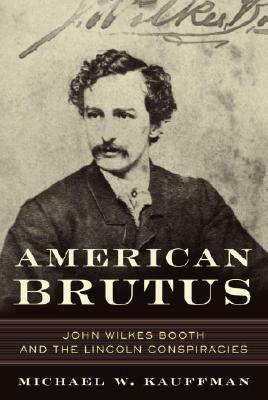 Perhaps the most famous example in American history, after Lee Harvey Oswald, is John Wilkes Booth, the murderer of President Abraham Lincoln at Ford’s Theater on April 14, 1865. Booth is alleged to have shouted “Sic semper tyrannis!” as he shot Lincoln in the back of his head as he watched the play Our American Cousin from his box. The most well-known representation of this historical episode in English is William Shakespeare’s 1599 play Julius Caesar. (Booth himself had acted in the play in the previous year, although not in the role of Brutus.) Julius Caesar is responsible for the popularization of the expression “the Ides of March.” The “ides” of a given month occurred halfway through it, i.e. the fifteenth on average. “Beware the Ides of March!” warns a soothsayer in Julius Caesar, advice that Caesar should have heeded, since eventually everyone’s luck runs out. 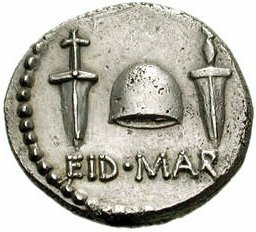 The coin pictured above was issued by Brutus in the autumn of 44 BC, with a cap of liberty between two daggers, and the legend EID[IBUS] MAR[TIIS], “on the Ides of March,” a rather bold statement on his part. But as it turns out, Brutus and Cassius did not have quite the support that they had hoped for. Caesar may have been a dictator, but he was a dictator with whom a lot of people agreed. An American might be conditioned to respond positively to the word “republic,” but in Roman terms “republic” meant “aristocratic control.” Caesar, for his part, was allied with the Populares, a party favoring the cause of the plebeians, as the Gracchi brothers originally were. So Caesar was a dictator who supposedly acted on behalf of the little guy. To illustrate this, Shakespeare has Marc Antony publicly reading Caesar’s will, which promises a certain amount of money to every Roman citizen, and which bequeathes his private parks for public use. Public opinion then turns decisively against the assassins. Historically, Marc Antony, Caesar’s great-nephew Octavian, and the general Lepidus formed the Second Triumvirate, which defeated the forces of Brutus and Cassius at the Battle of Philippi in 42 BC. 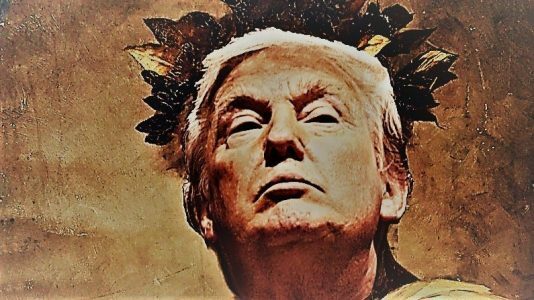 One cannot help but think that current American politics are a distant echo of the conflict between the Senate and Caesar. When President Trump declared this week that the situation at our southern border constitutes a national emergency, more than one of my Facebook friends specifically compared him to Caesar acting the dictator. This comparison is superficially true – Trump is certainly an ambitious egomaniac with Petronian tastes who has set himself up as an opponent of career politicians and other agents of the “deep state,” and who thus enjoys a great deal of support in flyover country on the supposition that he’s standing up for the ordinary people who live there. His emergency declaration, however, is well within recent constitutional history – indeed, according to the article from which the image above is taken, “Trump Is Bad at Being a Tyrant.” He deserves to be watched, of course, but in general his offensiveness seems far more aesthetic than legal. In the 30s BC, the Second Triumvirate suffered the same fate as the First: one member (Lepidus) was sidelined, and the remaining two fell out with each other. At the naval battle of Actium in 31 BC, Octavian’s general Marcus Agrippa defeated the forces of Marc Antony and of Cleopatra, with whom Marc Antony had taken up. Octavian chased them to Egypt, where they both committed suicide, Marc Antony by falling on his sword, and Cleopatra by venom from an asp. 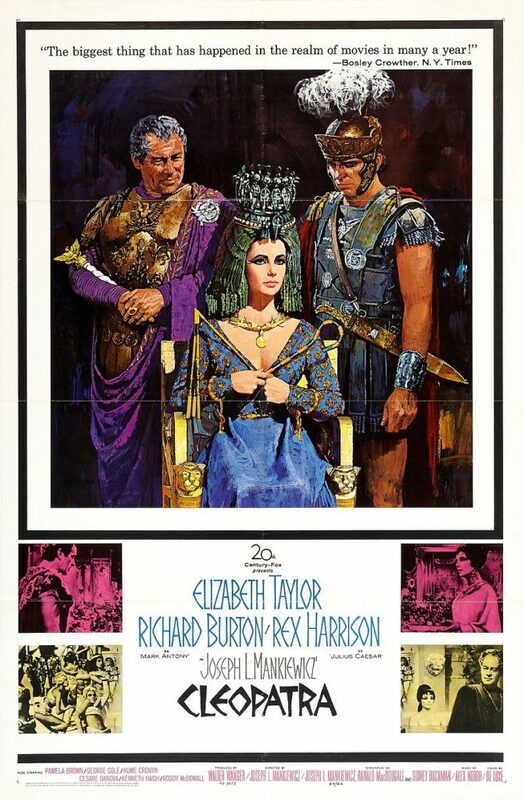 Cleopatra has not served as much of an “example” for subsequent generations but she is one of the most fascinating figures of this period of history, and has been portrayed many times on canvas, stage, and screen, including in another play by Shakespeare. Impatient for the world, and grasps his promis’d pow’r. Shakespeare uses this technique in Macbeth, written to celebrate the accession of James I to the throne of England in 1603. Set in the eleventh century, the play nonetheless shows Banquo’s descendants with “two-fold balls and treble scepters” – a reference to the fact that James was king of Scotland and England (and by extension Ireland). I hope this post serves as a demonstration of the double importance of history. The original events are important in themselves, and they also serve as a prism though which subsequent generations understand the events of their own times. So in studying the late Roman republic, not only will you learn about the republic itself, you’ll learn about the English Renaissance, the American Revolution, the Haitian Revolution, twentieth-century Communism, and even the present day.